Plot: Danny Maccabee (ADAM SANDLER) meets the girl of his dreams (BROOKLYN DECKER) but when she finds his wedding ring, for which he used to pick up women for one night stands, he enlists his loyal assistant Katherine (JENNIFER ANISTON) to pretend to be his soon-to-be ex-wife in order to cover up a careless lie. When more lies backfire, Katherine’s kids become involved, and everyone heads off to Hawaii for a ridiculous, out-of-control weekend that tests the limits of how far we’ll go for love. I like Adam Sandler from his earlier, star-making roles even to some of his current films. Yes, he’s a lot like Seth Rogen where he often plays off the same shtick no matter what the plot is or who his love interest is for that matter, yet at the same time I can laugh at him and find those movies at least passable. Here however, Sandler goes too far. No, it’s not really an offensive film, though it should be, nor is it void of laughs, even though it should’ve been but he went too far because as much as he wanted to make his character a likeable guy, what he does to get this girl, and in her pants if we’re being honest, is so inane. That’s not even the worst of it. Because this is a romantic comedy where we have two famous leads and the third wheel we all know the guy/girl does not belong with, the two leads must come together at the end and live in blissful harmony. I have to ask Aniston’s character: Why? Why would she even think about getting involved in a romantic relationship with a douchebag who would lie and put her and her kids through so much just to bang a hot blonde chick? I get his reasoning of course but to make him out to be a poor sap takes it beyond even the most mundane romantic comedy. And to Sandler’s character: what does he expect to happen if he did choose the other woman? To her, he still has two kids. Yeah, I know expecting logic from a Sandler film is asking for trouble but it only spotlights how half-assed the script is taking a concept with no exit strategy. Then you have Jennifer Aniston’s character. I like the gal. I’ve liked her since her days on “Friends” and in the occasional theatrically-released film and although I think she’s a bit overrated as a star – someone once described her as the female version of Clive Owen which is accurate – she does have a certain innocent charm that carries over onto the screen. That being said, I’m not sure why she would go along with this scheme. She initially does it for money and a new wardrobe and then wrangles her kids in it as well which turns into a free trip to Hawaii, set up at a fantastic resort hotel where he pays $8k and $12k/night for their rooms. Why? What’s her motivation? I’m all for out-there plot devices and all, especially in this genre, but there are times it takes things to where suspension of disbelief is not possible. Directed by Dennis Dugan, who has helmed a few other of Sandler’s comedies including Happy Gilmore, Big Daddy, Zohan and most recently, Grown Ups, and from a script by Allan Loeb (The Dilemma, Wall Street 2, Things We Lost in the Fire – how’s that for range?) and Timothy Dowling (Role Models), Just Go With It is a sad excuse for a romantic comedy even by somebody who can ignore the genre’s shortcomings. Even though there are a couple funny moments, mainly because I do like Sandler’s style of comedy, there isn’t enough to make up for a lousy plot that doesn’t at the very least have sensible characters. Cast and Filmmakers’ Commentary – Producer/Star Adam Sandler, Co-Star Nick Swardson and crew members, who exactly, I don’t know because they make no introductions and it sounds like we just walked in on a conversation. From what I could, with Sandler and Swardson is producer Tim Herlihy. Director Commentary – Dennis Dugan provides his own thoughts on the film and is a bit more technical about filming locations and such. For a solo track, it’s not bad, though there’s quite a bit of silence every so often. Laughter is Contagious (4:39; HD) is your basic gag reel where the cast go through line flubs and breakdowns. Deleted Scenes (16:57; HD) – Here we get 16 deleted/extended scenes (11-minutes of which are ** Blu-ray Exclusives **) that didn’t make the final cut. A couple aren’t too bad but there are good reasons they didn’t make it in. Dolph-Not the One from Rocky IV (6:11; HD) – Actor Nick Swardson is in focus with this featurette playing Sandler’s cousin who pretends to be a German Internet sheep trader. The Perfect Couple: Jen and Adam (5:51; HD) – After just about everybody else got their own featurette, now we get one on the two stars. The cast and crew talk about the two and working together. Like the others, this is yet another ho-hum featurette. The disc also has previews for Battle: Los Angeles and The Green Hornet. 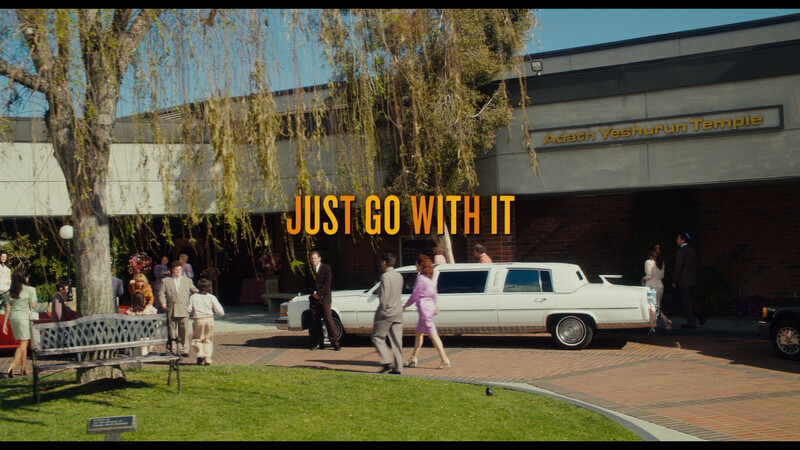 Just Go With It is presented in its original 1.85 aspect ratio and 1080p high-definition. The picture isn’t anything spectacular but probably par for the course for a comedy release. The detail level is pretty good and there is some fine amount of natural film grain or noise. While the video isn’t special, I’ve seen worse and it’s certainly good enough. The 5.1 DTS-HD MA track is very good for the genre, most importantly the dialogue levels were loud enough so you could hear most of the jokes hit the floor. There are other elements which make use of the rear channels like the idle chatter from the extras or the clichéd score by Rupert Gregson-Williams. Just Go With It might’ve sounded good on paper, or at least on the stage since it is based on a play, but the practicality of it even within the romantic-comedy realm just doesn’t add up. We have two characters that we’re supposed to like, and in fact at times do, but when you take a step back, their actions make no sense. Why does she want to be with a guy who seems to be a compulsive liar? Did he think things through before telling the lies and what the end game would be with the other woman? In regards to the Blu-ray, though, the audio and video transfers are good if not unremarkable, fairly standard for the format at this point, and there are plenty of features, albeit short, for fans of Sandler to enjoy. If you liked this movie, then maybe it’d be worth picking up on sale down the line, as it is it’d be worth a rental.